To enter a country, a franchisor has to find a licensee, secure trademarks, sign an international license agreement, train the new licensee, travel to their country and provide on-going support in order for the licensee to start-up and grow properly to produce royalties. Therefore, the biggest challenge a franchisor has in taking their brand global is choosing the right countries that will give them the best Return On Investment (ROI). 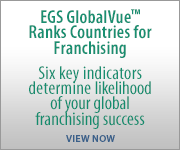 Some of the most important parameters the franchisor needs to know are: (1) the size of the consumer market that can afford their product or service in a country; (2) the legal environment and whether it will allow them to maintain control of their brand if a problem occurs; (3) how easy is it for a foreign company/brand to enter a country and what barriers to entry exist; (4) how easy is it to open a new business in a country keeping in mind that franchises are usually new business; and (5) what is the political and economic stability – or instability – of a country. EGS uses more than 25 information sources to establish and monitor these key parameters. 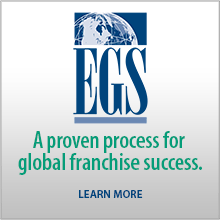 Plus, EGS has associates under contract in 32 countries that keep us up to date on their countries. This is not a one-time evaluation, but a constant research project. Things can change quickly in a country, taking it from being open to foreign brands and lots of local company investment to a downward market where new entries will fail. And economic parameters in a country can also begin to change for the better, which makes for opportunity for those franchises who are monitoring the world consistently. Market size for your franchised products or services is key. Lots of people in a country does not automatically make for lots of consumers who can afford to buy your franchised products or services. Take Indonesia with a population of 240 million and a strong desire for US franchises. The consumer base for most US franchises is the middle and upper class, which is about 20% of this number. Still a significant potential market! A few years ago the World Bank studied the occurrence of new investment by companies in a country. This is a very important parameter for franchisors because we need new investment happening to find licensees who will invest in our brands. The World Bank found that countries with annual Gross Domestic Product (GDP) growth of 4% or more are seeing new investment. 2-4% growth was ‘okay’. Less than 2% annual growth resulted in little new business creation. This makes sense and should be considered by franchisors looking at new countries to enter. If businesses are investing then we generally find consumers are also spending. This, or course, results in sales at businesses and royalties for franchisors. Three years ago, Ireland was near the top of countries to franchise into. Today, unfortunately, their GDP growth rate is near zero and they are trying to recover from almost 20% unemployment. But Ireland is very receptive to US franchises and will come back in the future. So, it is important to keep up with global trends in order to focus your annual marketing on the countries most likely to give you a good ROI. Another big challenge is how corrupt a country is because this directly impacts your licensee’s ability to do business and make a profit. And US companies are held responsible for how their licensees do business in their country under the U.S.’s Foreign Corrupt Practices Act of 1977. Here are links for information on particular parameters mentioned in this blog posting. (2) The ease of starting a new business in a country is usually tied to the economic freedom to open a new business in a country. (3) Legal concerns are important to evaluate so you will know how easy or difficult it is to franchise in a country and whether you can protect your brand in the case of a problem. (4) Corruption in a country impacts the ability of a business (franchise) to succeed. One of the best sources of information on country corruption can be found at the Transparency International website and on their Corruption Perception Index that measures more than 50 local parameters. The World Economy Is Up! No, Down! Posted on Jan 27th, 2014 in World Economy | Comments Off on The World Economy Is Up! No, Down! There has been a significant fall in currencies of Turkey, Brazil, South Africa, India and Russian against the dollar in recent days. “Argentina woes weigh on EM currencies”, Financial Times, January 24, 2014. Why are these emerging markets seeing declines? Is this caused by internal economic problems? Not exactly. Russia has seen a dramatic fall in foreign direct investment (FDI) due to rule of law challenges. Brazil has seen a fall in FDI due to protectionist government policies and the extremely difficult requirements to start up new businesses in the country. South Africa has real wage and union challenges, and the central bank controls payment in hard currency. Argentina, Venezuela South, both have huge inflation and a currency that is set against the dollar at an unrealistic level. Turkey is in the 12th year of the AK Party running everything and its leaders are seeing internal problems that are not good for FDI. China seems to be cooling off in the manufacturing sector, which means less imports of commodities from various BRICS countries. But there is evidence that the central government is working hard to turn a government sector economy into a consumer driven economy. China remains a great market to sell into. Consumer wages are increasing dramatically, as is the discretionary income of the middle class consumer. India, despite the pending elections and bureaucracy, remains a country with over 250 million middle class consumers who desire western products and services and can pay for them. But it is absolutely critical to chose the country licensees extremely carefully. So, what do franchisors seeking to sell into the BRICS+ do? I submit that you do research to find out the real cause of problems in the emerging markets and focus your efforts in 2014 on those that are least likely to interfere in their economy and most likely to welcome FDI without protectionist policies. Watch for projections of 4% or more real annual Gross Domestic Product (GDP) growth – follow ‘The Economist” magazine’s weekly analysis. The World Bank sees real economic growth and new investment when the GDP growth rate is 4% or more in a country.